The most trusted name in lake life enjoyment is bringing a fresh twist to shake up the Coeur d'Alene boat rentals industry with pontoon boats, ski boats, and wake surf rides that drop jaws and turn heads. Call us at (208) 449-0012 to book your boat rental today! From wake surf enthusiasts, to lake exploring speed boaters, to large party pontoon boat rentals, we have a package designed for you! With multiple boat options, pickup and drop off at the easiest (and tastiest) spot on the lake, The Buoy, located right by the boat launch. All rentals come with meals/adventures at the legendary Floating Food Truck or free scoop ice cream, this is the best and only way to experience Lake Coeur d'Alene to the maximum with the best deals in town! Buoy Boat is the name, premium wake experience is the game. This 24ft Tige is designed and outfitted to produce a mind blowing wave to get everyone in the boat wake surfing with ease. Outfitted with a custom Taps wake plate/ballast system, killer stereo system, and all the goodies needed for wake sports or tubing, some call the Tige the star of our fleet. Rate: $400-$785 per day. Buoy Food perks included! Fill out our form to receive a free quote! Big group of people looking to enjoy a full day on the water? The Buoy Pontoon boat is the answer. This pontoon boat is the definition of Lake Life. Grab your friends and family and enjoy a full day of Lake Coeur d'Alene exploration highlighted with visits to the key locations and restaurants on the lake. Rate: $350-$600 per day. Buoy Food Perks Included! Call for availability or fill out our form to receive a free quote! Here to see all the beauty of Lake CDA? Not interested in water sports? 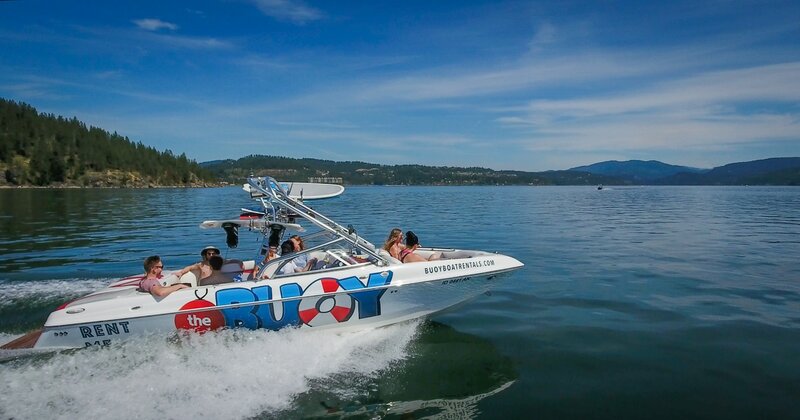 The Buoy Speed Boat is your key to seeing all that Lake Coeur d'Alene has to offer at an elevated pace. From cruising Beauty Bay to an ice cream at The Buoy Floating Food Boat, the speed boat will get you everywhere. Rate: $400-$600 per day with Buoy Food Perks included! Call for availability or fill out the form below to receive a free instant quote and a free Buoy Burger Coupon! Special Bonus Coupon is a Free Meal at the Food Boat! Right next to the Coeur d'Alene Resort! -We have owned and operated businesses on Coeur d'Alene and surrounding lakes for 10+ years. In 2006 we started teaching wakeboard and wake surf lessons to locals and tourists of the Coeur d'Alene area. Today, we teach lessons, rent out boats, and run three lakeside restaurants, including The Buoy Floating Food Truck! The Buoy is a locally owned company by three young individuals who have a passion of bringing people together to have lakeside fun. Where do we pick up our boat rental? -We can deliver the boat to whichever lake you are staying at. If you are booking a boat rental on Lake Coeur d'Alene, we meet you at The Buoy Harbor (which is the building at the public boat launch ramp at the end of the pier). Go to the McEuen Public Parking lot and you won't miss it. Once you make it to this parking lot, you will see signs with arrows that will direct you to where your boat rental will be waiting for you. The first two hours are free, and each additional hour is a small fee. Do you ever offer discounts or perks? - Absolutely, we want you to have the best boating experience possible on Lake Coeur d'Alene. We pride ourselves on having the best perks in the game. Some of these being.. Buoy Food Discounts, price drops for multiple day rentals, water sports equipment. What does it take to reserve my boat rental dates? -It's simple, give us a call and we will see if your desired week is available. If it is open, we only require 20% down to reserve and hold your boat rental slot. -If you cancel your boat rental 10 days before your booked drop off date, we will refund your 20% down in the form of a Buoy Gift Card. The Buoy Credit can be redeemed at a later date in the season or within a year, by either booking another boat rental, water sport lessons, or eating at our floating food truck/ lakeside bar and grill. Do we have the option to add a driver to our boat charter? -Yes, if you want a driver to cruise you around the lake and make your experience that much more enjoyable, we can make it happen. We have professional drivers with an A-plus attitude to show you and your group a fantastic fun time! Our drivers are not boring, we can promise you that. ​I heard The Buoy also provides wake lessons and instructions, is this true? -Yes, this is actually what we specialize in. Our knowledge in this realm is what allows us to design the best wake surf boat for rent in the area. We have been teaching lessons for 11 years and each of our wake surf boats are specialized and designed to pump out the ultimate wake surf wave. If you're trying to wakeboard or wakesurf behind it, get ready to ride a wild wave/wake. Can I book a wake surf boat rental and get lessons in the same day? -Absolutely, if you want to rent out the boat for the day and only want three hours of lessons in the morning , we can do that. All of our teachers have been wake surfing and wake boarding for years. Our instructors have taught deff people, kids with down syndrome, and people that didn't even know how to swim. To say the least, we know exactly how to teach all ages and abilities. We have even taught a 74 year old grandma how to do a backside 360 on a wakesurfer. And no, I'm not joking. If you want this option, give us a call and we will work it out for you. -Yes, the name, address, and phone number will be below.